Florida is somewhat famous for its short-term dramatic weather patterns. Hurricanes and tropical storms are a common occurrence. And everyone looks forward to the afternoon thunderstorms that seem to pop up daily during the hot summer months. These types of short-term weather patterns can cause real damage to your house, starting with a roof leak and getting much worse. Asphalt shingles can get torn or pulled completely off the roof by high winds. This leaves the roof’s underlayment and deck open to the elements. It can also expose older roof materials. Any of these conditions can lead to a roof leak. Asphalt shingles can also get flipped up by the wind, breaking the bond between the shingle layers. This leaves an opening for the rain to penetrate under the shingles, causing a roof leak. Falling hail can leave dents and pockmarks in shingles and flat roofs. It can remove the protective granules on top of the shingles. It can also cause damage to the built-up part of a flat roof. Hail can cause chipping and breaking in tile roofs. These hard balls of ice can hit with a lot of strength. A broken tile can easily lead to a roof leak. Roof damage can occur to any part of the roof during a hurricane or intense storm. However, wind tends to cause more damage along the edge of the roof. Hail usually causes damage to the angle of the roof that takes the most direct hit. Why Calling in a Professional is So Important? Many times it can be difficult to spot roof damage after a hurricane or storm. The best thing to do is bring in a professional to inspect your roof after a storm comes through. Otherwise, you may start to experience a roof leak or worse. Shingles that get flipped up from high wind can leave behind cracks or curled edge. The pockmarks and other damage caused by hail is another thing that can be difficult for a homeowner to find (it’s also extremely dangerous to climb on roofs). It takes an experienced eye to see exactly what the ice pellets left behind. 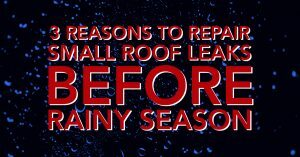 Call on the experts at Mark Kaufman Roofing before you get a roof leak due to short-term Florida weather patterns. Living in Florida gives you a broad mix of climate conditions from sunshine to hurricanes. As a homeowner, you must have a clear understanding of the state’s variable weather patterns to protect against a leaky roof, especially if it’s a flat roof. Here are some of the different types of roof damage that can affect Sunshine State residents due to weather. Roofs can fail for various reasons, many of which are related to climate and how the roof was originally installed. One of the drawbacks to the excessive sunshine Florida gets is that it can degrade shingles over time, causing them to dry out, crack and warp. Missing shingles means less protection and greater chances of a leaky roof. 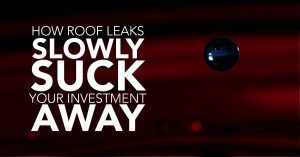 Whenever you detect any signs of a leaky roof, it’s time for an inspection. Bigger roofing problems occur from stormy weather. Rain and heavy winds can make existing roof damage worse, as moisture penetrates your home. This moisture can lead to rotting wood, as well as mold. If these problems persist it may lead to a weaker structure. When moss, which develops from rain, soaks in moisture, it can cause moss to spread and weaken your roof. Hail, despite being made of small granules of ice, can be harmful. Hailstones larger than an inch in diameter can cause severe damage. Heavy winds, even not as strong as hurricanes, can blow shingles off your roof and allow moisture to seep in, causing an even more troublesome leaky roof. They can also clog your gutters and cause trees to collapse on your home. 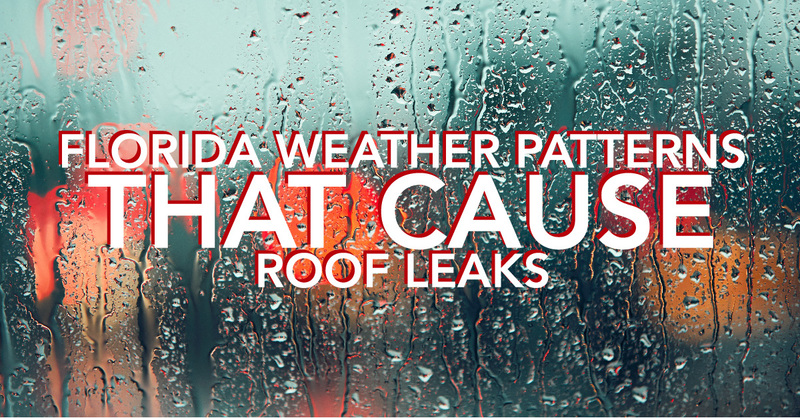 Humidity is part of the Florida lifestyle, but it can also lead to a leaky roof. You can minimize this problem by keeping the interior of your home as free of moisture as possible. Humidifiers and proper ventilation systems in the attic can help keep this area dry. Reducing indoor humidity will help your roof last longer. It’s important to notify a roofing expert when you notice internal moisture and missing shingles. Knowing the health of your roof at all times through routine inspections will prevent future expensive maintenance. When you need long-term protection for a leaky roof in Florida, contact us here at Mark Kaufman Roofing for high-quality solutions. We are dedicated to responding to your needs quickly so that you can put roof worries behind you.